One of my favorite interviews ever was the one between George Plimpton and Ernest Hemingway, which originally ran in the Paris Review in 1958. 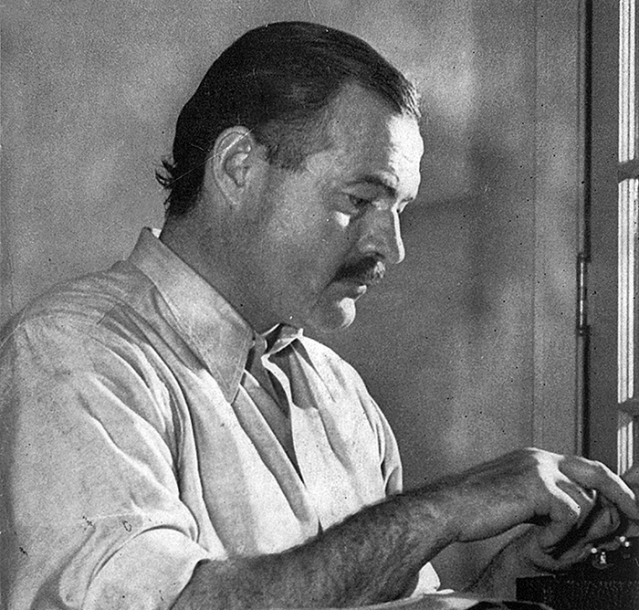 Besides Plimpton’s ability to paint a picture of Hemingway’s writing space that literally transports the reader to the author’s desk, it’s full of insightful tips for writers, and Hemingway’s frank and humorous personality. I’m sharing some of my favorite bits here and you can find the link to the full interview below. A man of habit, Hemingway does not use the perfectly suitable desk in the other alcove. Though it allows more space for writing, it too has its miscellany: stacks of letters; a stuffed toy lion of the type sold in Broadway nighteries; a small burlap bag full of carnivore teeth; shotgun shells; a shoehorn; wood carvings of lion, rhino, two zebras, and a wart-hog—these last set in a neat row across the surface of the desk—and, of course, books: piled on the desk, beside tables, jamming the shelves in indiscriminate order—novels, histories, collections of poetry, drama, essays. A look at their titles shows their variety. On the shelf opposite Hemingway’s knee as he stands up to his “work desk” are Virginia Woolf’s The Common Reader, Ben Ames Williams’s House Divided, The Partisan Reader, Charles A. Beard’s The Republic, Tarle’s Napoleon’s Invasion of Russia, How Young You Look by Peggy Wood, Alden Brooks’s Shakespeare and the Dyer’s Hand, Baldwin’s African Hunting, T. S. Eliot’s Collected Poems, and two books on General Custer’s fall at the battle of the Little Big Horn. Here’s the link to the full interview from the Paris Review, and it’s well worth the read (in my opinion:)). For all Hemingway books, visit Amazon’s Ernest Hemingway Page. For a super cool site dedicated to Hemingway, check out The Hemingway Project. If you’re trying to develop a Hemingway-ish style, you can put your prose to the test at the Hemingway App, where you’ll be measured on how well your style matches up the literary giant’s standards. It’s really fun! For information on Hemingway’s Florida Keys residence, go here. For info on his polydactal (6-toed) cats, check this out. For info about his Cuba residence, go here. A beautiful piece by Time magazine. Another excellent one by the Smithsonian. That’s all for now! Happy Writing! Hop over to my new site here, where you can find this article and many more!